I always felt like I had the weight of the world on my shoulders. I took on all the problems and solutions for those closest to me. For the most part, I didn’t decide to be this way. Other people either encouraged or demanded that I be the one responsible for their problems or needs. 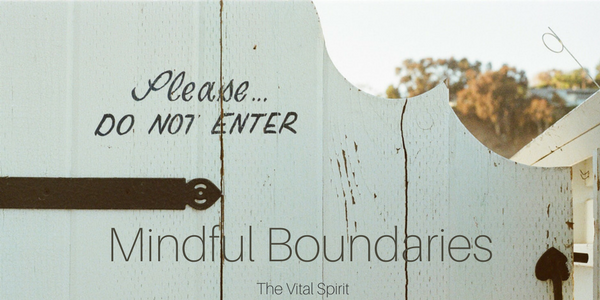 I admit when the concept of healthy boundaries was first presented to me, I was confused. I had no notion of what a boundary was or even what it was for. It was a journey of reflection on the people in my life and what they were struggling with figuring out. Then looking inward and realizing I was attempting to solve their problems for a number of reasons. First, I was good at that kind of help and it made me feel important or valuable. Second, certain people came to expect me to solve their problems. And last, I didn’t know what I brought to the friendship if I didn’t act as Master Problem-solver. Letting go and not taking on that job anymore was hard and totally worth it. The only thing I need to bring to a relationship is me. Relationships aren’t about doing or solving things for each other, no matter how good we are at it. It is about companionship, respect, seeing each other as whole people, not projects. Learning what was appropriate for me to take on, and what wasn’t, was liberation. It was about trust and faith, in myself and the Universe. I left some friends and a husband behind, and I gained an understanding of my value and worth as an individual. And I gained peace, in my heart and in my mind. I also found many new and nourishing friendships that are a better reflection of my values and beliefs. Do you struggle with taking on too much responsibility for others? Are you ready to let go of that responsibility?